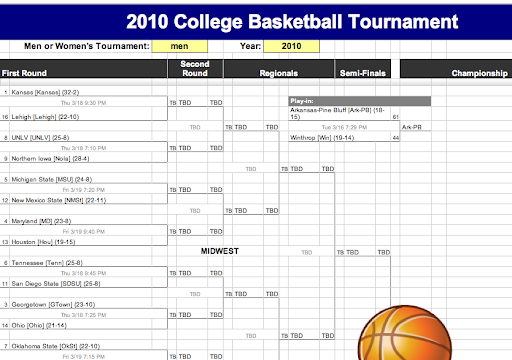 The first round of the 2010 NCAA Division I men's college basketball tournament is starting and in celebration, the Google Docs team has brought back the College Basketball Tournament bracket template for 2010. This template is powered by the GoogleTournament function which John Danaher created last year in his 20% time. Since you can add collaborators to your spreadsheet, it's easy to engage in some friendly rivalry right within the spreadsheet. Like last year, the template includes 10 blank brackets that each of your friends can fill out. No need to print out and fill-in blank paper brackets. There's one sheet that shows whose picks are the best. You can even customize the point values for each game if you want using points sheet. Other Google teams are getting into the basketball spirit. From an iGoogle gadget, to live scores, to a Google Earth plugin, there is something for every basketball fan at google.com/collegebasketball2010.